Once upon a time in a galaxy not so far away, Hootah lived on the planet Squiddly-Diddley. Each morning he would wake up and eat a story for breakfast. He would look out the window and see storybook characters and watch flowers growing larger and brighter as the birds read stories to them. Hootah was very happy on Squiggly-Diddley until one day… Hootah woke up and there were no stories! He had no breakfast. He looked out the window and saw… nothing! So Hootah took his spaceship out of the garage and made his way to planet Earth where he heard children knew a lot of stories. 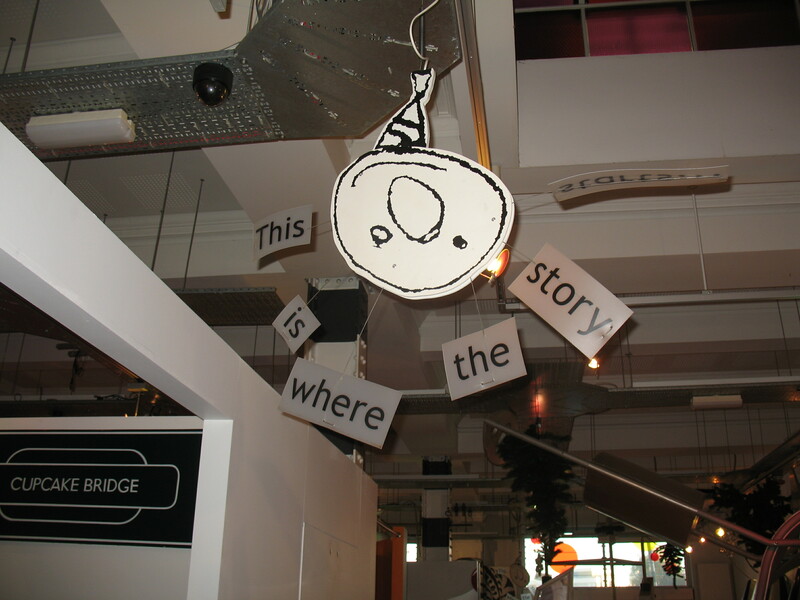 The Story Starts at Discover Chilren's Story Centre! 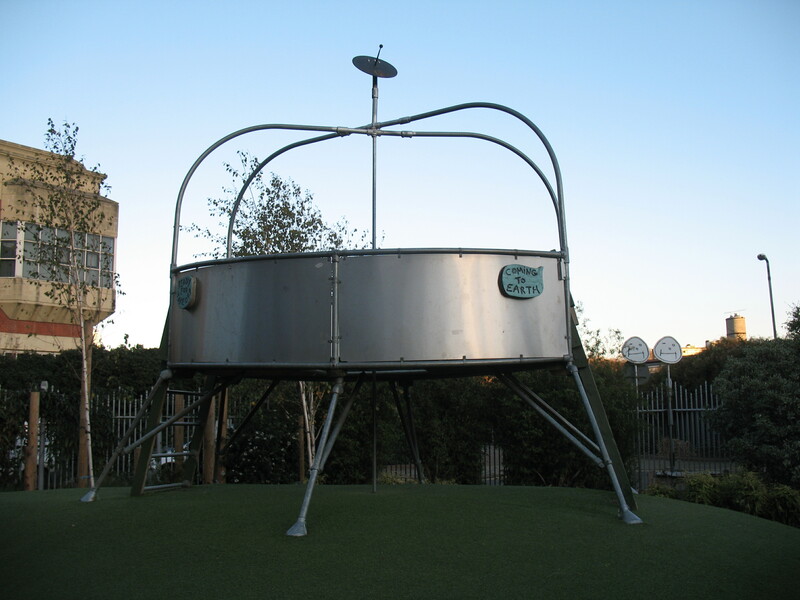 Luckily, Hootah’s space ship landed in the back garden of the Discover Children’s Story Center, London’s only children’s museum. Unlike the American model of cross-curricular children’s museums, Discover focuses entirely on literacy. School groups are the primary audience on weekdays. Children are told the story of Hootah, then play and explore in the museum, and finally a staff member (called a Story Builder) leads them through writing the rest of the story. At the end of the session they make puppet characters from the story and hang them on a story tree. After the school sessions are over, Discover opens its doors to the general public. It is open weekends to the public as well. Now eight years old, Discover reaches about 60,000 people a year through its on-site and outreach programs. 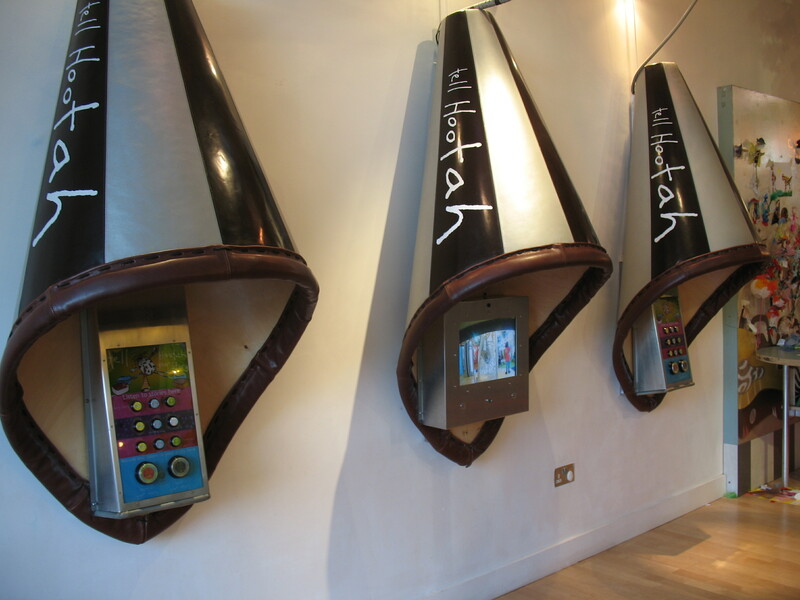 The facility has two levels and an outdoor garden area that includes the remnants of Hootah’s spaceship. The ground floor houses its permanent collection of exhibits. The basement is home to temporary exhibits that change annually. This year the exhibit is ‘Monsterville.’ Next year’s will be Super Heroes. Both the outdoor and indoor areas include climbing and sliding structures as well as story and literacy-building features. There are nooks, soft areas and books in every corner of the museum. There are plenty of places for writing, drawing, acting out and recording stories also. In one area there are large sheets of paper to write on, tear off and take home. In another area you can write on the smooth surfaces of sets and mirrors. There are several areas to pull together costumes and props to act out and imagine stories. 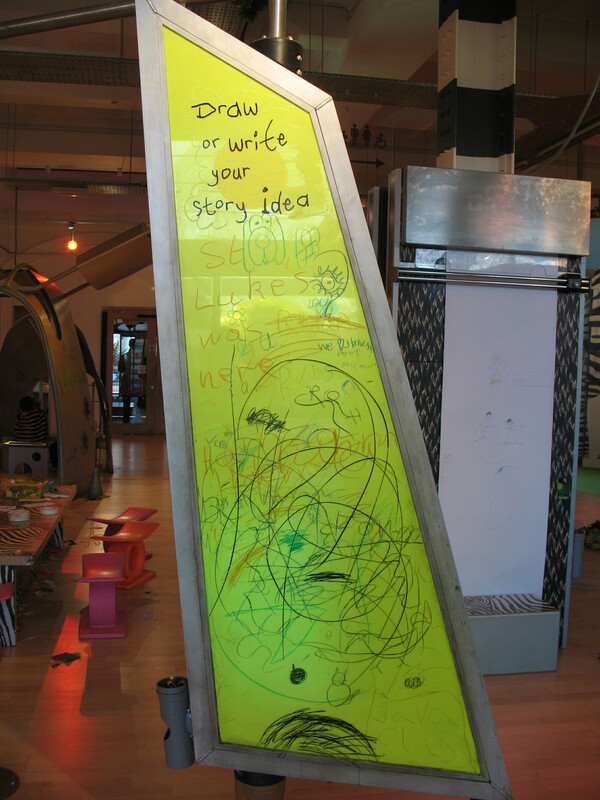 There are stations throughout the museum where children can record stories they are imagining. The stations have three buttons labeled beginning, middle and end. 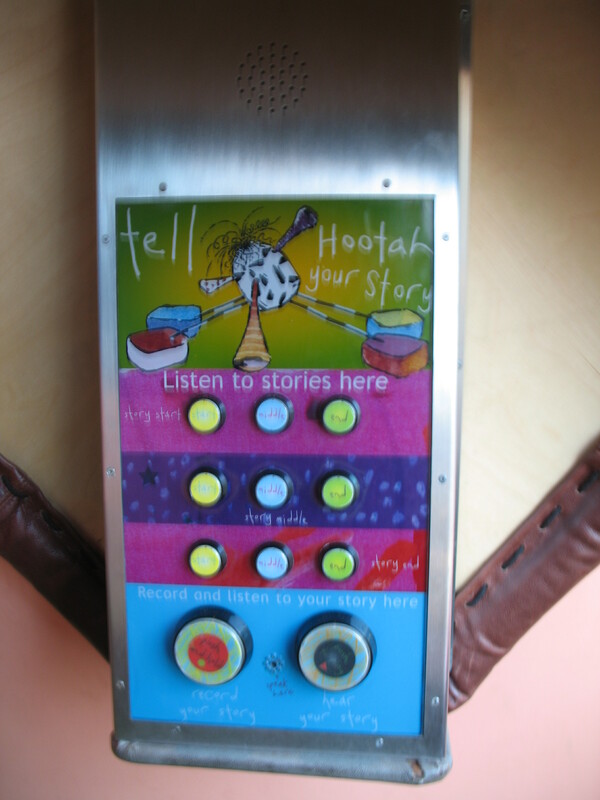 Children press the button to record segments of their stories and then they can play them back to hear what they’ve created. In addition to their wonderful facility, Discover has developed some interesting programs. Events are scheduled every weekend to keep the museum fresh and relevant, and compete in the large marketplace of London. The events feature author or illustrator presentations and storytelling. Their outreach program goes out into the community to record stories of residents and the many cultures they come from. They created a couple of CDs with these stories which feature both children and adults sharing stories. One of the strengths of Discover is that they serve the community they set out to serve, namely the lower-income schools and residents of the area. Discover is located in Stratford which is the area of London where the 2012 Olympics will take place. The Olympic Village and Venues as well as a huge new shopping mall are transforming the neighborhood. Discover will be part of the transformation – in fact, it has been commissioned to create stories during the Olympics. While speaking to their stellar executive director, I learned there are many similarities between Fairytale Town and Discover. We are both literacy and arts based charitable organizations. We both earn the majority of our revenue through admissions and work hard to raise money to fill the gap. We have similar-sized boards and staffs who are involved and dedicated. We each have limited space and resources to do the things we do. And we both create magical memories for those who visit us and a common culture for our communities. While Discover is currently the only children’s museum in London, another one is in the works, and there is the venerable V & A Museum of Childhood. A separate wing of the opulent Victoria & Albert Museum, the Museum of Childhood tells the story of childhood from Victorian times to the present with displays of toys, games and child-care items. 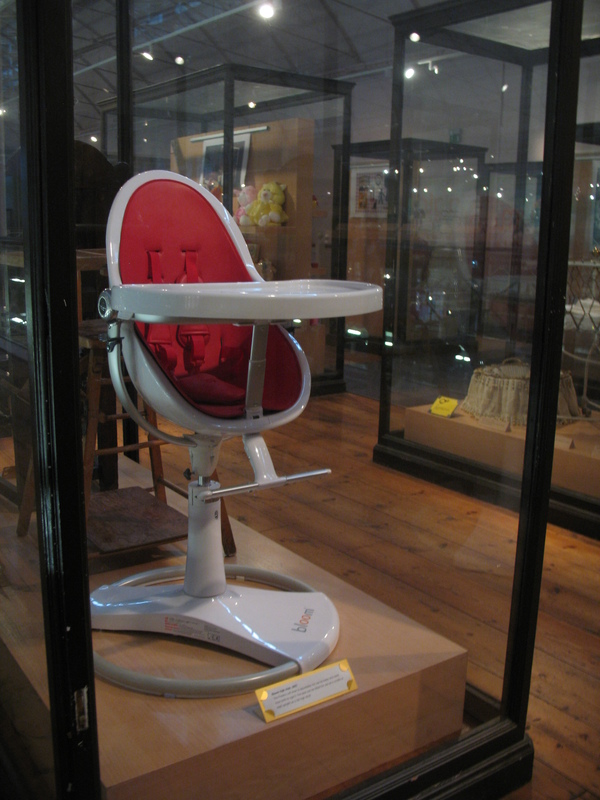 Wandering through their huge permanent collection I saw everything from hand-made zoetropes and doll houses to board games and super-hero figures; and from bassinettes and breast pumps to prams and cribs. 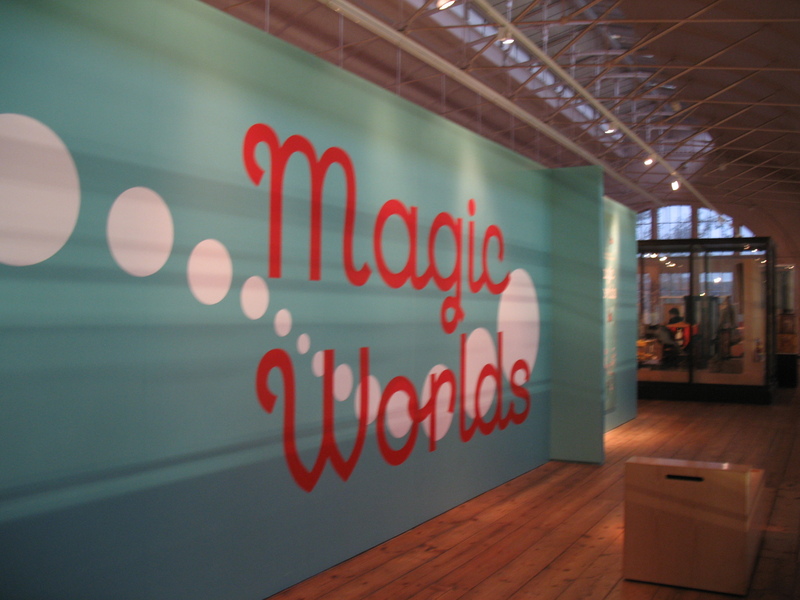 The museum also has temporary exhibits; the one currently on display is ‘Magic Worlds.’ It incorporates visual displays of books and information about genres and authors with play-oriented and hands-on activities. 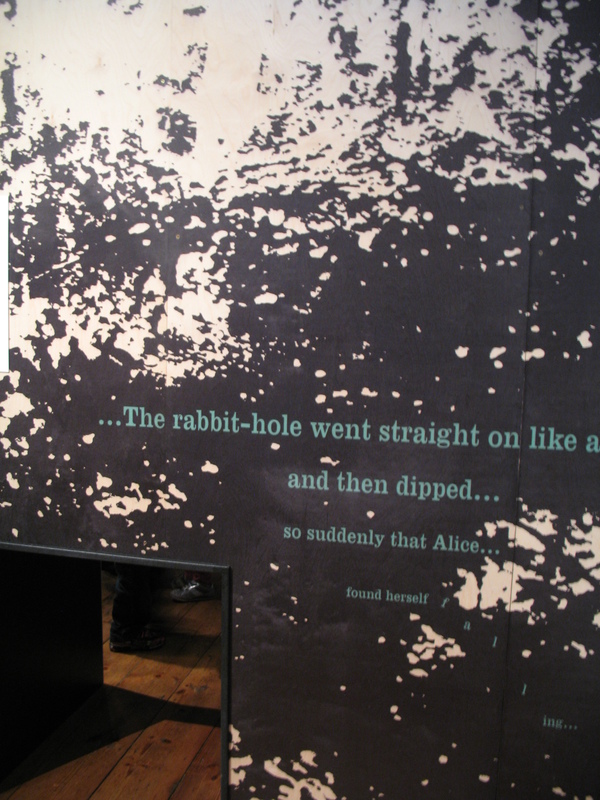 For example the area on the story of ‘Alice in Wonderland’ has a tunnel for kids to crawl through to the next exhibit on ‘Hansel and Gretel’ and vice versa. In the area on Shakespeare there are costumes children can use to become witches and props they can use to add ingredients (like eye of newt) to a cauldron. The adults I saw there were having a good time reminiscing about their own childhoods while exploring the exhibits, and the children I saw were so engaged in the hands on activities that they didn’t want to leave. The Museum of Childhood clearly shows us that while times have changed, at least one thing has remained the same: children need to play. The importance of play is recognized here, and those who provide it are pretty well-organized. 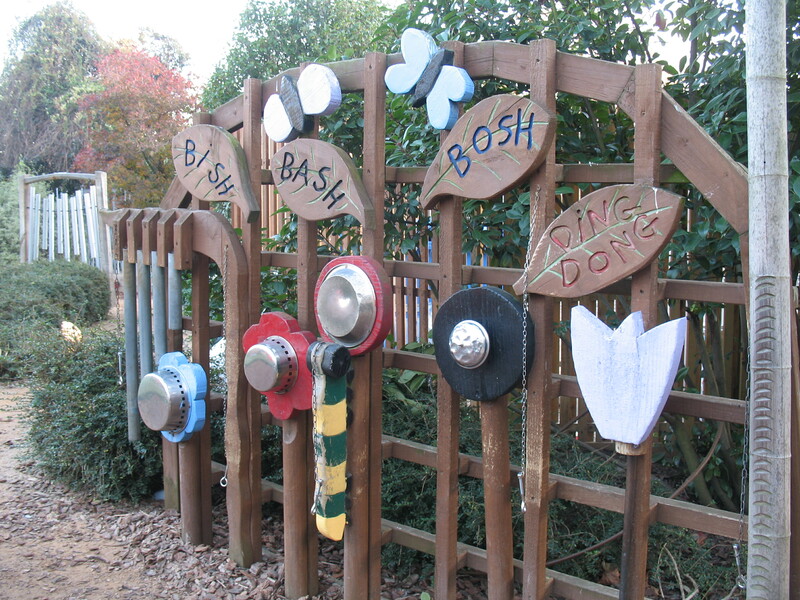 I was able to attend the Annual Meeting of Play England, a national association of play organizations, and the annual Play Conference offered by the Play Association of Tower Hamlets, a community-based group of adventure playgrounds and playworkers. More on that later! Your trip has so many wonderful episodes and the latest is a gem. I do not know if you have had opportunity to see the Noah’s Ark exhibit at the Skirball? I think that you would like it – animals on the ark constructed out of found materials – the violin case alligator stands out in my mind’s eye. Regardless – received the postcard from the local watering hole and it is much appreciated. Happy Thanksgiving and I hope that you have a chance to prepare a traditional feast for some of the locals, it would be fun to hear what their take on our national food fete is and, also accepting the challenge to discover all pertinent ingredients in the Land of the Angles. Hi Scott. I haven’t been to the Skiball exhibit. Will put it on my list for my next trip down there. Happy Thanksgiving to you too! Hope all is well with you.